A championship level, last chance qualifier for D2 and D3 schools from Central to Northern New Hampshire. 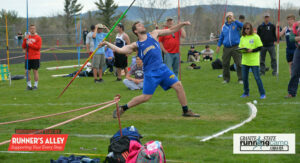 Steep in NH tradition and efficiency, the individual and team competition has produced some phenomenal track and field. The uniqueness to this meet is seen from its organization. Simply stated, each member school is assigned a field event to run. From tape measures to officials, if the school does not provide, the event will not be contested ensuring each member school having an investment in the meet running efficiently giving its athletes the best chance for success! This make the Wilderness Championships a fantastic example of how our sport should be showcased – an 8-Ring Circus with no dead track time! While we will not be livestreaming this event, a full broadcast will be uploaded to this hub soon after! Please keep checking back to this hub as all interviews and pics will also be added once edited and published. Good luck to all! Recap! Interviews! Meet Broadcast! 2018 Wilderness League Championships!